Tucked inside a Ballard coffeehouse, this sandwich spot might not have quite the right East Coast vibe. But the sandwiches are on point. It’s unsettling to order a profoundly East Coast regional sandwich while standing in a profoundly Ballard regional espresso bar. The newest (and sadly, the only) iteration of Bauhaus, which is also home to Hog Island Hoagie, smells like coffee, not red wine vinegar and dried oregano; the background noise is espresso ordering and making instead of a meat slicer and extroverted, perhaps even invasive Philly-accented commentary. There’s too much floor space and not nearly enough Tastykake options. Well, get over it already, because the sandwiches are so right that it’s just fine the space is all wrong. Duplicating a Middle Atlantic sandwich outside of its natural habitat isn’t easy, in large part because of the differences in bread. 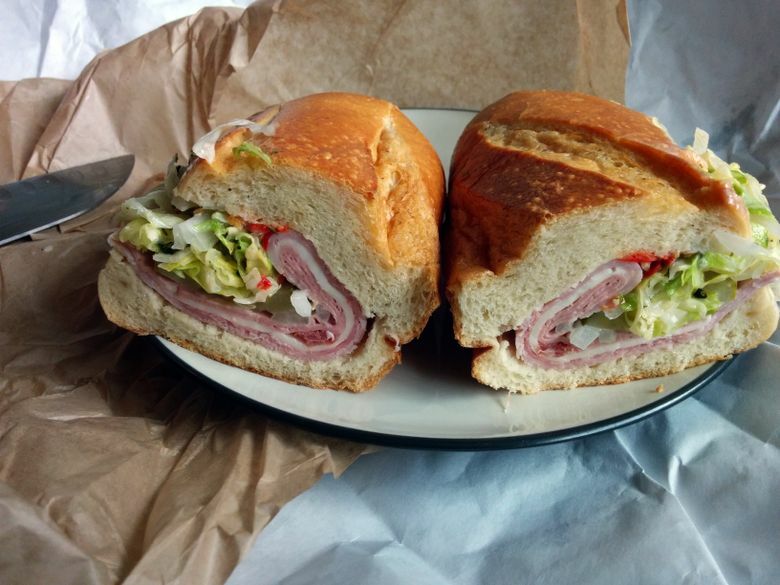 Seattle has excellent bread, but none of it is proper hoagie bread, which needs a chewy density that doesn’t disintegrate after being overstuffed and drizzled with oil and vinegar, along with a complete lack of a crisp crust or any notes of sourdough. This isn’t to say it lacks flavor, and Hog Island Hoagie’s custom-made roll has plenty of correctly salty flavor. Philly-area natives will almost certainly quibble over details — Is the chew perfect? Are the dimensions precisely correct? But don’t make the mistake of overthinking this while sharing lunch with a local, who might just inhale your sandwich while you’re still talking with your hands to elaborate on the differences. The menu: There are 10 hoagies (including a portobello-based vegetarian and a Field Roast-based vegan) featuring local ingredients like Mama Lil’s sweet peppers cozying up to imports like New Jersey’s Thumann’s Meats. Aside from that, the counter has a basket of Herr’s chips (a third-generation family-owned Pennsylvania snack company) in a range of flavors (the Salt and Vinegar is all you really need). A promised assortment of Tastykakes proved to be two packages of chocolate cupcakes; even Seattleites know that Butterscotch Krimpets and Peanut Butter Kandy Kakes are the ones worth eating, which is probably why they were sold out. Don’t miss: The Hog Islander Flagship is the classic Italian hoagie, with ham, salami, capocollo, mortadella and provolone dressed with sweet and hot peppers, tomatoes, onions, shredded lettuce, dill pickle chips, mayonnaise, oil and vinegar and dried oregano. This combination as-is deserves to be on a definitive list of world’s greatest sandwiches, and Hog Island’s version is entirely pleasurable. Ordering ahead: It took just under 20 minutes for the sandwiches, handed over with a “thanks for your patience” comment. While that might be somewhat longer than usual, hence the gratitude, phoning in your order in advance would be more efficient, and a steady stream of wise customers appeared to have done just that. Prices: Hog Islander Flagship Italian, Chicago Dock, and Easy Hen ($11 each) added up to $33 plus tax and tip for lunch (with leftovers) for three people.